Have You Ever Hunted in Canada? What Province? Canadian whitetails. When you think of those two words in the same sentence, the mind drifts to vast forests, rolling fields of agriculture and absolute pure wilderness. The two accompanying provinces that generally come to mind are Alberta and Saskatchewan — not Ontario. The truth? Ontario has some giant whitetails. And some giant-whitetail killers. Kevin Beasley is one of those and is the youngest of three brothers — Kevin, Keith and Paul. Like his siblings, he started hunting at an early age and really took to it. 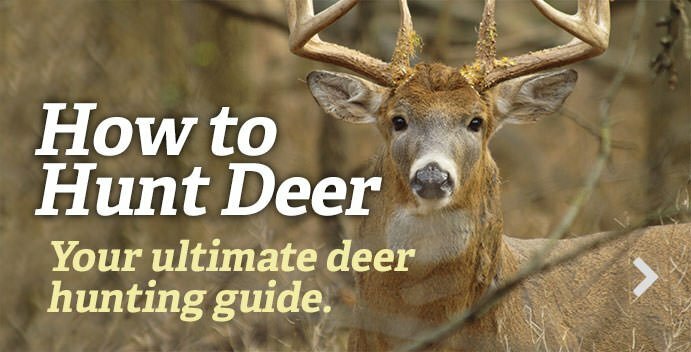 Naturally, they have Canada’s largest hunting show called “Canada in the Rough.” And that journey led him to a buck named “64” that proved just how incredible Ontario deer hunting is. The story of this deer all started in 2017 when the Beasley’s received a trail camera photo of a really nice whitetail—a 4½-year-old 6x4 with a ton of promise. The band of Beasley brothers didn’t put a tag on the buck that season. But things were destined to change in 2018. November 15, 2018, brought a massive wave of snowfall to the region. Needless to say, things were supercharged, and the stage was set for pursuing 64. The landscape blanketed with a fresh sheet of snow, and overcast skies still spitting light flurries, Kevin headed afield on what would become one of the biggest days of his life. Choosing a good entry route that wouldn’t spook deer, he eased toward an old, overgrown golden rod field he thought might produce. Big timber bordered the eastern and southern borders. Looking westward, Beasley scanned the edges of a large swamp for movement as he eased along. He even glassed the far side of the golden rod field where another brushy patch of land laid. No deer. He continued easing toward his treestand. But he never made it there. He soon spotted a big deer chasing a doe across the opening. Needless to say, things got sporty in a hurry. Beasley scrambled to get into position to make a shot. After a quick discussion with his father, he got the gun on the buck as quickly as he could and waited for his shot. He didn’t have to wait long. The buck presented a nice shot opportunity and Beasley slowly pulled the trigger — sending a round downrange. The buck immediately piled up. It’s clear this is a very important deer for him and his family. His father, Ken, was with him during the hunt. It was also interesting because there were other hunters who bordered the property on every side. This property wasn’t some overly manicured property. This was your typical real-life deer hunting scenario. This massive deer ended up being aged at 5 ½ years old. The buck scored 198 6/8 inches (gross green score) and 186 2/8 inches (net score). All said, this is a truly incredible Ontario buck with loads of character and a meaningful story to go with him.